Objective: To examine the influence of intravenous pulsed methylprednisolone (MP) on bone mass. Methods: 38 patients (30 women) with various rheumatic disorders requiring intravenous MP pulse treatment were examined at baseline and after 6 months with dual energy x ray absorptiometry (DXA), measuring hip and lumbar spine bone mineral density (BMD). Demographic and clinical data were collected. Results: Demographics showed: mean (SD) age 48.4 (16.3) years, body mass index 24.9 (5.1) kg/m2, and median (range) disease duration 3.2 (0.1–40.0) years. During follow up patients received a mean cumulative MP dose of 3.0 (1.6) g given as 5.7 (2.0) pulses over a median period of 5.7 (2.3–33.7) months. 34/38 (89%) patients were also pulsed with cyclophosphamide, 20 (53%) were taking oral corticosteroids, and 8 (21%) were using either bisphosphonates or oestrogen. At the end of the study mean BMD was reduced by −2.2% at the femoral neck, −1.1% at the total hip, and −1.0% at the spine L2-4. In subgroups BMD increased in patients treated with bisphosphonates or oestrogen (femoral neck +1.6%, total hip +3.2%, spine L2-4 +4.5%), whereas BMD decreased at all sites in patients not treated with antirersorptive treatment, both for users (femoral neck −4.4%, total hip −2.4%, spine L2-4 –2.1%) and non-users of concomitant oral prednisolone (femoral neck −1.7%, total hip –1.9%, spine L2-4 –2.6%). Conclusion: Treatment with intravenous pulses of MP leads to a high rate of bone loss. Prevention of bone loss in these patients with bisphosphonates and oestrogens should be considered. Immunosuppressive pulse treatment with intravenous methylprednisolone (MP) is used to treat patients with severe forms of various rheumatic disorders—for example, systemic lupus erythematosus,1 primary vasculitic disorders,2 and rheumatoid arthritis.3 Although corticosteroids (CS) are a well known cause of osteoporosis, no studies examining the influence of pulse treatment with MP on bone mass have, to our knowledge, been published,. A general belief has been that short courses of pulse intravenous MP do not result in long term bone density changes.4–7 Our aim was to examine the extent of spine and hip bone loss in patients treated with pulses of MP according to a standardised protocol8 and to look for associations between bone mineral density (BMD) changes at baseline and during follow up. ESR (mm/1st h) = 107.08×PV−162.47. The MP, given as intravenous infusions, was intended to be given as six pulses at doses of 6.6 or 10 mg per kilogram body weight, based on disease related protocols. However, in some cases this dose and the infusion intervals were altered according to the patient’s response. The numbers of pulses with MP were recorded and cumulative doses calculated. Patients use of oral prednisolone, antiresorptive treatment (ART) (oestrogen, bisphosphonates), calcium, and vitamin D supplementation and concomitant pulses with cyclophosphamide were recorded. Of the eight patients using ART, four had not been using this treatment before the pulses. During the follow up period they received treatment with antirheumatic drugs, including disease modifying antirheumatic drugs and CS as well as bone sparing drugs (ART and calcium and vitamin D) according to the judgment of the treating doctors. Hip (right hip measured) and spine (L2-L4, anterior posterior view) BMD were measured at baseline and after the MP treatment period. The baseline dual energy x ray absorptiometry (DXA) measurements were ideally performed before the first pulse. MP pulses given before a 14 day limit were recorded as previous MP treatment given. The follow up DXA was measured after the last MP infusion was given. All analyses were performed with SPSS (Statistical Package for Social Sciences) program 9.0 (SPSS, Chicago, IL). Paired and independent two tailed Student’s t test, analysis of variance (ANOVA) (ad hoc test Bonferroni), and Pearson’s χ2 test were used when appropriate. Values of p⩽0.05 were considered significant. Multiple linear regression analysis was performed using all the baseline and longitudinal variables mentioned in the clinical assessment to predict bone loss at follow up. Table 1 shows the patient, disease, and treatment characteristics for all patients and for the three subgroups: patients not using concomitant oral prednisolone, patients using concomitant oral prednisolone, and patients treated with ART. At baseline the mean (SD) age of the patients was 48.4 (16.3) years, the median (range) disease duration was 3.2 years (0.1–40.0), and 30/38 (79%) patients were female. The median (rande) follow up time between the first and second DXA was 5.7 (2.3–33.7) months. During follow up the mean C reactive protein was 10.4 mg/l (5.0–108.5) and ESR 13.8 mm/1st h (0.0–49.3). There were no statistically significant differences in demographics between the three groups (table 1). Between the subgroups there were significant differences in frequencies of diagnosis and for follow up time as displayed table 1. Seventeen patients (45%) had not received MP before the first DXA, 16 (42%) patients had started their MP treatment 3 months, 3 (8%) patients 6 months, and 2 (5%) patients over 6 months before the first DXA measurement. In patients who started MP treatment before the first DXA, the mean cumulative dose was 1700 mg given as a mean of 3.3 pulses. Oral prednisolone was used by 50% of the patients (mean (SD) daily dose 14.3 (6.3) mg). No significant differences between users and non-users of concomitant oral prednisolone were found in the anti-inflammtory treatment given before inclusion in the study, except for oral prednisolone. During follow up the mean cumulative MP dose for all patients was 2969 mg given as a mean of 5.7 pulses. Oral predisolone was used by 20 (53%) (median daily dose 10 mg (range 5–35)) patients. During follow up 21 (55%) patients did not receive any osteoporosis treatment, 9 (24%) patients received calcium and vitamin D only, and 8 (21%) patients were treated with antiresorptive drugs. Table 1 gives further details of the anti-inflammatory and osteoporosis treatment. A comparison of the three groups, non-users of osteoporosis treatment, calcium and/or vitamin D user, and user of ARTs (ANOVA and Pearson’s χ2 test), showed no difference between the groups (data not shown). During the study period, the BMD was reduced: –2.2% at the femoral neck, −1.1% at the total hip, and –1.0% at the spine L2-4 (fig 1). BMD increased in the subgroup of patients treated with ART (femoral neck +1.6%, total hip +3.2%, spine L2-4 +4.5%), whereas BMD decreased at all sites in patients not treated with ART, both for users (femoral neck –4.4%, total hip –2.4%, spine L2-4 –2.1%) and non-users of concomitant oral prednisolone (femoral neck −1.7%, total hip –1.9%, spine L2-4 –2.6%) (fig 1). Percentage BMD change during follow up (mean with 95% confidence interval) in all 38 patients treated with methylprednisolone (white column), in the following subgroups: 14 patients not treated with antiresorptive drugs nor additional oral corticosteroids (light grey column), 16 patients not treated with antiresorptive drugs but additional oral corticosteroids (dark grey column), and 8 patients treated with antiresorptive drugs (black column). ART includes hormone replacement therapy (HRT) or bisphosphonates. Values in the table below the figure are baseline BMD (SD) values and BMD change (Δ% BMD) with standard error of the mean (SEM) for the different treatment groups at the different measurement sites. The p values are from the overall ANOVA. 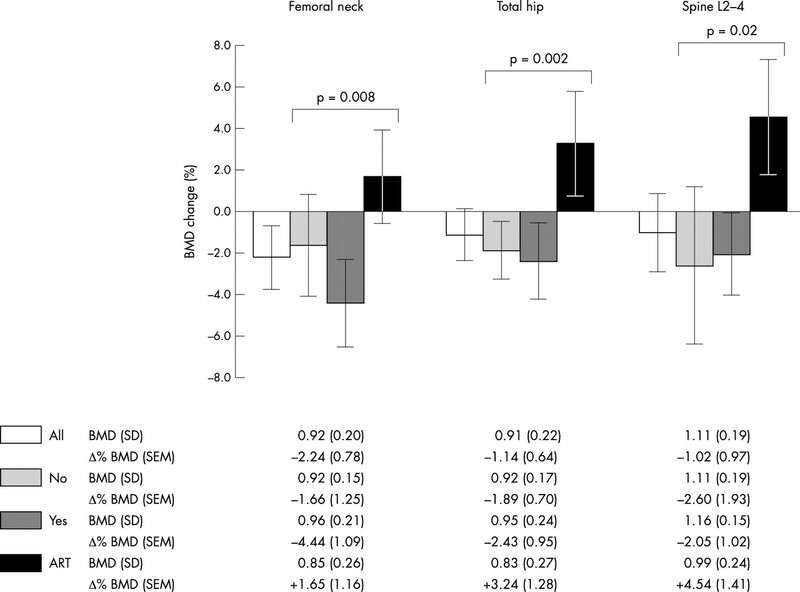 Mean bone loss was less pronounced in patients treated with calcium and/or vitamin D than in patients who received neither ART nor calcium or vitamin D (femoral neck −2.2% v –3.5% p = 0.42, total hip –0.4% v −2.8% p = 0.05, spine L2-4 –1.2% v –2.7%; p = 0.50). For patients not treated with ART a significant difference in the number of days between the first and second DXA was found between users and non-users of oral prednisolone treatment (mean 325 (264) days v 160 (85) days, p = 0.03), but no significant difference in bone loss was found between the two groups (fig 1). A significant difference between users and non-users of oral prednisolone treatment was found for the calculated equivalent cumulative dose, including both oral and pulse treatment of CS (mean 7604 (4460) mg v 4401 (1977) mg, p = 0.02), but no difference was found for the mean daily dose calculated as an equivalent prednisolone dose (30.9 (18.8) mg v 31.1 (13.7) mg; p = 0.98). Among the variables in table 1 only the use of antiresorptive drugs was statistically significantly associated with BMD change at all measurement sites using univariate linear regression and none of the CS variables. In a multivariate linear regression model, adjusting for inflammation and cumulative use of MP, ART was still the only variable found to be independently associated with change in BMD. To our knowledge the impact of pulse intravenous MP on bone mass has not previously been studied. Theoretically the short exposure time to CS using pulses of intravenous MP could be less harmful for the bone and not lead to CS induced bone loss, which seems to be a general belief among experts in CS osteoporosis.4–7 This view has been supported by studies examining calcium and bone metabolism in patients treated with intravenous pulses of MP,4–6 demonstrating only a small and reversible change in markers of bone resorption and formation within a few days after infusion. Our study, however, demonstrated that intravenous pulse treatment with MP, as currently used in the treatment of patients with various rheumatological disorders, leads to a high rate of bone loss. However, as shown in fig 1 this bone loss in patients treated with pulses of MP is arrested by the concomitant use of antiresorptive osteoporosis treatment with HRT or bisphosphonates. The rate of bone loss in patients treated with calcium and/or vitamin D had a tendency to be less pronounced than in those who did not received any osteoporosis treatment; however, BMD did not increase. A positive effect of bisphosphonates,12 calcitonin,13 calcium and/or vitamin D14 on bone density in patients treated with oral CS has been shown in several studies. Our results are in agreement with the results from randomised controlled trials comparing bisphosphonates with calcium alone or in combination with vitamin D.15–17 HRT was previously recommended as first choice for prevention and treatment of CS induced osteoporosis.18 However, later evidence based recommendations prefer bisphosphonates.19–21 These recommendations were intended to be applied to patients using long term CS and not to patients receiving pulses of MP, and no guidelines have been published for patients treated with intravenous pulses of MP. In our study five patients were concomitantly treated with bisphosphonates and three with HRT; 50% of these patients had a T score ⩽−2.5 SD and 75% a T score ⩽−1.0 SD at baseline (data not shown). Surprisingly, no significant difference in BMD loss was found between users and non-users of oral prednisolone treatment (fig 1), even though the users of prednisolone were followed up for a significantly longer period than the non-users and the cumulative dose of CS was significantly higher (table 1). The mean daily dose of CS during follow up, calculated as equivalent prednisolone doses, did not differ between the two groups (∼30 mg/day). In CS treated patients, especially those receiving high doses, bone loss appears to be most rapid in the first 6–12 months of treatment (for review see Sambrook et al22,23), which may explain why no difference between the users and non-users of oral prednisolone was found in our study, despite signifcant differences in the length of follow up and the cumulative CS dose. Bone loss in patients treated with CS may be reversible and transient.24–26 In a longitudinal study a significant reduction in BMD was seen during the first 12 months, whereas BMD increased in the subsequent 12 months as the steroid dose was reduced.25 In a cross sectional study no permanent reduction in BMD was seen in patients with polymyalgia rheumatica and temporal arteritis using daily oral low dose CS compared with controls.26 Furthermore, in Cushing’s syndrome a 20% bone loss has been shown to recover after successful treatment.27 The bone loss seen in our study patients may therefore be reversible at follow up when intravenous pulse MP is stopped. Our study was designed as a prospective observational study with no disease control group and not as a randomised controlled study, which limits the strength of our findings. The inflammatory diseases themselves may therefore also have contributed to the observed bone loss. Other obvious limitations of our study include the heterogeneity of diagnosis, variation in doses and time schedules for both pulses of MP, and concomitant oral prednisolone treatment. These study limitations, however, do reflect the challenges that the clinician faces in daily clinical practice when treating patients with severe organ manifestations, where treatment decisions often have to be changed during follow up to respond to the course of the disease. This is also reflected by the fact that this is the first study performed examining bone loss in patients treated with pulses of MP, even though this is an established treatment option for these diseases. The most convincing results for bone loss in the present study are found at the total hip. This may partly be explained by the more precise BMD measurement at this site compared with the femoral neck and lumbar spine, which have poorer precision. On the other hand, information from observational studies is also of value as recently underlined in a editorial by Kvien et al.28 They allow insight into “what happens in the real world”. In a recently published population based, longitudinal observational study, examining patients with rheumatoid arthritis, a positive effect of HRT and bisphosphonates on bone density was also seen in patients treated with CS.29 Ideally, the results in our study should be confirmed in a double blind randomised controlled trial before final conclusions are drawn and recommendations given for treatment of patients with intravenous pulses of MP. However, the question is whether the evidence from this study and others makes such a comparison unethical. We conclude that CS treatment with intravenous pulses of MP leads to a high rate of bone loss that cannot be ignored. Prevention of bone loss in patients treated with intravenous pulses of MP should be considered. This is especially important in patients with low BMD, high disease activity, and other risk factors for osteoporosis. Illei GG, Austin HA, Crane M, Collins L, Gourley MF, Yarboro CH, et al. Combination therapy with pulse cyclophosphamide plus pulse methylprednisolone improves long-term renal outcome without adding toxicity in patients with lupus nephritis. Ann Intern Med2001;135:248–57. Haugeberg G , Bie R, Bendvold A, Larsen AS, Johnsen V. Primary vasculitis in a Norwegian community hospital: a retrospective study. Clin Rheumatol1998;17:364–8. van der Veen MJ, Bijlsma JW. The effect of methylprednisolone pulse therapy on methotrexate treatment of rheumatoid arthritis. Clin Rheumatol1993;12:500–5. Bijlsma JW, Duursma SA, Huber-Bruning O. Bone metabolism during methylprednisolone pulse therapy in rheumatoid arthritis. Ann Rheum Dis1986;45:757–60. van der Veen MJ, Bijlsma JW. Effects of different regimes of corticosteroid treatment on calcium and bone metabolism in rheumatoid arthritis. Clin Rheumatol1992;11:388–92. Lems WF, Gerrits MI, Jacobs JW, van Vugt RM, van Rijn HJ, Bijlsma JW. Changes in (markers of) bone metabolism during high dose corticosteroid pulse treatment in patients with rheumatoid arthritis. Ann Rheum Dis1996;55:288–93. Mier RJ. Prevention of corticosteroid induced osteoporosis. J Rheumatol1997;24:407. Adu D , Pall A, Luqmani RA, Richards NT, Howie AJ, Emery P, et al. Controlled trial of pulse versus continuous prednisolone and cyclophosphamide in the treatment of systemic vasculitis. Q J Med1997;90:401–9. Hutchinson RM, Edworthy SM. A comparison of the erythrocyte sedimentation rate and plasma viscosity in detecting changes in plasma proteins. J Clin Pathol1977;30:345–9. Haugeberg G , Uhlig T, Falch JA, Halse JI, Kvien TK. Bone mineral density and frequency of osteoporosis in female patients with rheumatoid arthritis: results from 394 patients in the Oslo County Rheumatoid Arthritis Register. Arthritis Rheum2000;43:522–30. Haugeberg G , Uhlig T, Falch JA, Halse JI, Kvien TK. Reduced bone mineral density in male rheumatoid arthritis patients: frequencies and associations with demographic and disease variables in ninety-four patients in the Oslo County Rheumatoid Arthritis Register. Arthritis Rheum2000;43:2776–84. Homik J , Cranney A, Shea B, Tugwell P, Wells G, Adachi R, et al. Bisphosphonates for steroid induced osteoporosis. Cochrane Database Syst Rev2000:CD001347. Cranney A , Welch V, Adachi JD, Homik J, Shea B, Suarez-Almazor ME, et al. Calcitonin for the treatment and prevention of corticosteroid-induced osteoporosis. Cochrane Database Syst Rev2000:CD001983. Homik J , Suarez-Almazor ME, Shea B, Cranney A, Wells G, Tugwell P. Calcium and vitamin D for corticosteroid-induced osteoporosis. Cochrane Database Syst Rev2000:CD000952. Adachi JD, Bensen WG, Brown J, Hanley D, Hodsman A, Josse R, et al. Intermittent etidronate therapy to prevent corticosteroid-induced osteoporosis. N Engl J Med1997;337:382–7. Saag KG, Emkey R, Schnitzer TJ, Brown JP, Hawkins F, Goemaere S, et al. Alendronate for the prevention and treatment of glucocorticoid-induced osteoporosis. Glucocorticoid-Induced Osteoporosis Intervention Study Group. N Engl J Med1998;339:292–9. Cohen S , Levy RM, Keller M, Boling E, Emkey RD, Greenwald M, et al. Risedronate therapy prevents corticosteroid-induced bone loss: a twelve-month, multicenter, randomized, double-blind, placebo-controlled, parallel-group study. Arthritis Rheum1999;42:2309–18. ACR. Recommendations for the prevention and treatment of glucocorticoid-induced osteoporosis. American College of Rheumatology Task Force on Osteoporosis Guidelines. Arthritis Rheum1996;39:1791–801. Adachi JD, Olszynski WP, Hanley DA, Hodsman AB, Kendler DL, Siminoski KG, et al. Management of corticosteroid-induced osteoporosis. Semin Arthritis Rheum2000;29:228–51. Boulos P , Adachi JD. Guidelines for the prevention and therapy of glucocorticoid induced osteoporosis. Clin Exp Rheumatol2000;18:S79–86. ACR. Recommendations for the prevention and treatment of glucocorticoid-induced osteoporosis: 2001 update. American College of Rheumatology Ad Hoc Committee on Glucocorticoid-Induced Osteoporosis. Arthritis Rheum2001;44:1496–503. Sambrook PN. Corticosteroid induced osteoporosis. J Rheumatol1996;45 (suppl) :19–22. Sambrook P , Lane NE. Corticosteroid osteoporosis. Best Pract Res Clin Rheumatol2001;15:401–13. Hall GM, Spector TD, Griffin AJ, Jawad AS, Hall ML, Doyle DV. The effect of rheumatoid arthritis and steroid therapy on bone density in postmenopausal women. Arthritis Rheum1993;36:1510–16. Dolan AL, Moniz C, Dasgupta B, Li F, Mackintosh C, Todd P, et al. Effects of inflammation and treatment on bone turnover and bone mass in polymyalgia rheumatica. Arthritis Rheum1997;40:2022–9. Haugeberg G , Myklebust G, Dovland H, Mikkelsen B, Gran JT. No permanent reduction in bone mineral density during treatment of polymyalgia rheumatica and temporal arteritis using low dose corticosteroids. Scand J Rheumatol2000;29:163–9. Pocock NA, Eisman JA, Dunstan CR, Evans RA, Thomas DH, Huq NL. Recovery from steroid-induced osteoporosis. Ann Intern Med1987;107:319–23. Kvien TK, Mikkelsen K, Nordvåg BY. Results from controlled clinical trials: how relevant for clinical practice? J Rheumatol2003;30:1135–7. Haugeberg G , Orstavik R, Uhlig T, Falch JA, Halse JI, Kvien TK. Bone loss in patients with rheumatoid arthritis. Results from a population based cohort of 366 patients followed over two years. Arthritis Rheum2003;46:1720–8.